Arriving at Garner’s at 3 o’clock, it was a cold but sunny afternoon, so after waiting 10 minutes or so for then engine to warm up, I pulled out on to the main road. As I was taking it easy for the first few miles a short queue of traffic started to build up behind me, but as soon as I past the nation limit speed sign on the way out of Kemble I just floored it! Second gear is all it takes; barely above idle at 30 miles per hour, up to 60 in a matter of seconds (and once again I head a clear rearview mirror). As an aside: it didn’t actually take that long for those behind me to catch up, and since becoming a Ferrari owner I’ve become a lot more speed conscious and so have a tendency to keep to the speed limit more so now than ever. (It’s as my dad said I already have the car, I have nothing else to prove to anyone.) So zooming off to 150mph is only going to hurt me when I get caught—and I don’t want to get caught because I have a lot to lose. So… all I can conclude is that those drivers saw (and heard) a Ferrari accelerate from 30 to 60 and disappear round the corner, and they collectively thought let’s catch up, and proceeded to exceed the speed limit to catch up with me (because let’s face it, if we assume a top speed of 60mph on the straights, the 360 can easily hold a higher speed through the corners, so for those behind to catch up they must have had a higher average speed which mean a higher top speed on the straights and therefore they were in excess of the speed limit). On the 21st of December I had the opportunity for a medium-distance, winter run in my Ferrari. Christmas Eve is my brother birthday, so on the Saturday before we headed down to Southampton to see him and his fiancée. I drove my mum and myself, whilst my dad followed in his Jaguar with the dog. The plan was head to their house, go for lunch, walk the dogs and eventually head back to the Cotswolds. I know these are not really Ferrari related but basically—with regards to the 360—nothing happened until the drive home: high oil pressure, and when I say high, the needle was stuck against off of the limiter! There was almost nothing else wrong (there was a knocking but I’ll come to that later), but cruising at a constant 70mph should not have caused the gauge to fluctuate. I accept that stepping on the gas might have this affect but a steady throttle shouldn’t. After slowing to a crawl (of about 40mph) in the dark, on the M4, the oil pressure eventually settled (high–ish, but settled). After nursing her home, I started to make a list of things that I was going to have the team at Slade’s look at: handbrake (the cable had been replaced prior to my collecting the 360 and would likely need a slight adjustment after 1,000 miles or so); knocking (divers side, couldn’t quite pinpoint front or rear, but possibly suspension); squeaking (again, drivers side, likely dust in the brakes as the frequency was dependant on speed—also on occasion a good, hard brake would cause it to cease); scratch on drivers door; scuff under nose; and of course the oil pressure (could be the gauge or even the sensor). So on the Monday before Christmas I called Slade’s and was able to arrange dropping the 360 off on the 3rd of January. When the new year finally arrived, the weather was horrible! I drove, via Oxford, barely above 50mph, even on the Motorway because spray was terrible and with 400bhp under my right foot it really wasn’t worth going any faster—I imagine much to the delight of everyone else on the road who must having been thinking something along the lines of why is that mutter out in a Ferrari in this weather‽ I can assure you that if it hadn’t been for the necessary warranty work and slight paint job, I would have been on the train. Once I arrived at my destination I had a brief word with Daniel about me list, and he agreed to get the repairs done and then call with an estimate for the cosmetic work. It was a probably about a week later when I received my first call, which was pretty good going considering I had been told their head mechanic was on holiday until (I think) the 6th or 7th. The knocking was a ball joint, the squeaking was the brakes (don’t let them start to rust over—they’re not ceramic after all), and the oil pressure had’t been an issue: the gauge was okay and the sensor wasn’t faulty. I have since learned that this is likely just the way it is; at higher engine speeds the pump has to work harder and therefore the pressure increases (still, I think I’ll keep an eye on it). I was told the work to the underside of the nose was actually an easy job, as the damage wasn’t to the lovely red bumper but the black, under-body shield; however, the drivers door was going to take some time as the scratch would need to be sanded away, and then obviously the layers built back up, with a suitable depth of clear-coat too. Nearly two weeks passed before I heard anything, but it was good news! She was ready for collection, and this time I managed to broker a deal for collection on a lovely Saturday afternoon. Having arrived at Beaconsfield station I was told to look out for a VW Golf, although I couldn’t see one anywhere. Eventually I asked a young man who was standing around whether he was from Slade’s and as luck would have it, he was (but his Golf had been modded like anything and had a full body kit, so I let myself off for not noticing straight away). 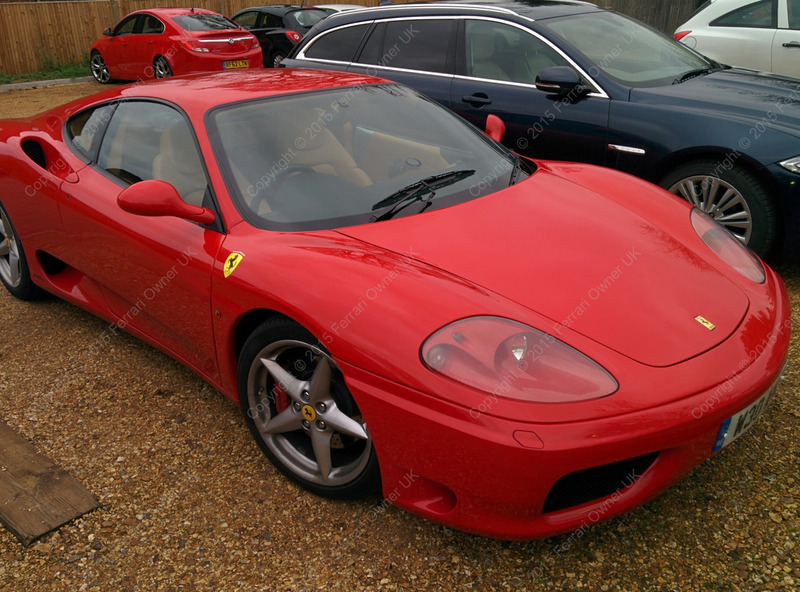 Arriving at the showroom I was greeted with the news that I couldn’t have my Ferrari, as between the storage facility and showroom, the generic warning light had come on, and after being hooked up to their diagnostic equipment, a fault with the drivers door sensor was identified. Having taken the door apart to respray it, it turns out it wasn’t quite put back together, but I was told it would be a quick fix and so while I waited I had another look around the showroom, eyeing up the potential customers who had made an appointment and were also wondering about. Once the door was back on and the grubby hand prints polished away, I was ready to go. 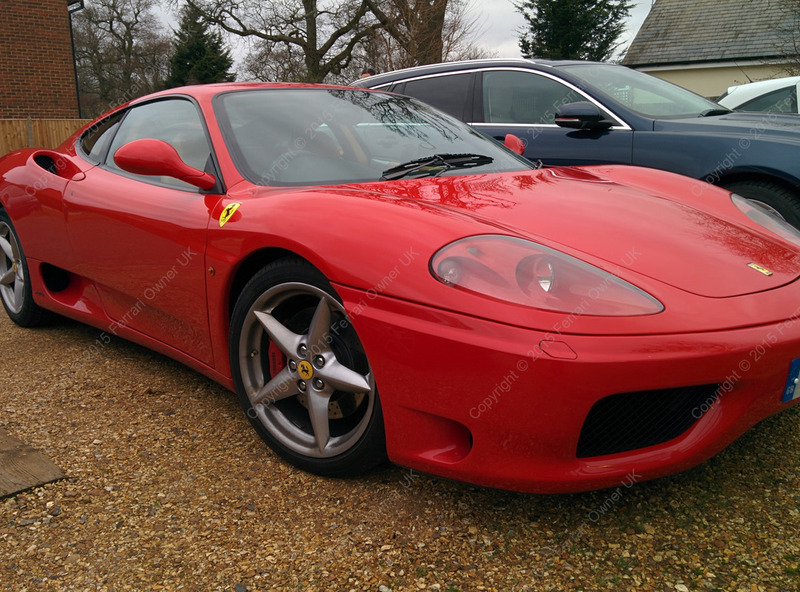 While I had been waiting at the station I had noticed a number of high performance cars drive past, mostly Porsche’s and Aston Martin’s, so I thought why not add a Ferrari to the mix? And with that, I made my way to the M40, had a casual drive around Oxford, and an enjoyable cruise along the A40, past the Cotswold Wildlife Park and in to the quiet little village where my parents live. Job done. It just occurred to me that there was also an issue with the engine cover heating element (you know, the one that all car rear windows have). I suppose that normally Ferrari owners don’t take their cars out in conditions that require the rear window to be defogged, but I did, and I noticed that it stayed fogged. The guys at Slade’s looked it to this when I dropped her off in January, and all it was, was a fuse. Again, it was something so simple that often gets overlooked when MOTing, servicing, and even purchasing, any car. That said, I am glad that it wasn’t anything more serious.